They went on to link this “subjective life expectancy” with when older workers plan to retire, as well as when they actually do retire. Men, for example, think they have about a 7 out of 10 chance, on average, of living to age 75 – based on their parents’ experience – and so they make their plans to retire at 64. But men who think that they have half those odds of making it to 75 will plan to retire about four months earlier than their peers. Subjective life expectancy also influences women’s plans, and the magnitude of the impact is similar to men. And should the sudden death of a parent cause longevity expectation to worsen, individuals reduce their planned retirement ages, the researchers found. It could be a mistake, however, to assume we’ll be like our parents. Life expectancy has risen rapidly in recent decades, so people are living much longer. Consider a 65-year-old man today. He can expect to live to age 84, or about four years longer than men at that age could’ve expected to live three decades ago – in other words, the men of his father’s generation. It makes financial sense for many older workers to stay in the labor force, so they can increase their monthly Social Security benefits and add to their retirement savings. But doing the right thing financially can be obscured by perceptions about life and death. When I am 90 years of age Mom will be 113! 🙂 ? My father died this year at age 94. Both he and my mother it turns out come from a very long line of people living into their 90’s. This puts a new light on what resources are needed for a comfortable retirement. Time of death may not be totally predictable, but family history can put us in the ballpark. As retirement planners we have to move beyond the entrenched definition of “retirement age 65”. I think you’ve hit on the main point: it’s great to live longer but it’s expensive! Both my mother and father passed away at 86. Mom’s father lived until 94, and Mom’s sister passed at 92. My father’s uncle lived until 102. Based on their ages and their very good health until the last couples of months of their life, I will retire next year at age 68. Both my mother and father lamented, if they had known they would live so long, they would not have retired at 62. Dad said he had hoped to make it to age 72 and had he known he would live so long, he would have replaced the roof with a 30 year life, instead of 15. I have outlived my father, both grandfathers, and a brother. I am age 60. While the women in my family live a long time, the men do not. But my wife’s family lived long lives. So I slug on building retirement security for her sake, being very conservative. We already are way ahead of most couples. But I want my wife, after I am gone, to still able to live an affluent lifestyle. I bet I am not the only man who thinks this way. This is a very interesting study. 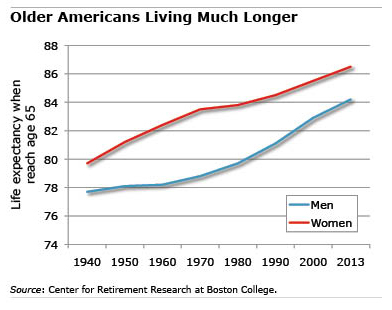 Do you think people consider that average life expectancy has increased since their parents retired? Or do they just base it on their parent’s experience? I’m a financial planner in Australia and I’m seeing an interesting trend. I’m seeing more people in their 60’s who are retiring and who still have at least one parent still alive. I rarely saw this ten years ago. It makes for interesting conversations.